Like a standard scripted section, they sacrifice player control for greater speed. 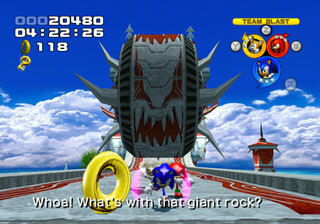 In contrast to a standard section, they feature a colossal object that chases Sonic. Spectacle sections create a massive impact. However, like standard scripted sections, they also offer limited scope for player interaction. This causes frustration, as the obstacles occur too quickly for the player to react. Dramatic scripted sections are a special type of scripted sequences. Similar to a scripted sequence, the player has limited control. In most cases, the player doesn’t even have to hold down the forwards button as Sonic moves forwards automatically. In contrast to standard scripted section, dramatic scenes contain a gigantic object that chases the player (or the player has to chase). The player may also have to dodge objects on the path. Dramatic scripted sections rarely occur more than twice in a game (if even that) in the classic games. ▲ In this spectacle sequence, Sonic is chased by a warship. The sections produce a dizzying sense of spectacle. Their rarity allows them to remain fresh and exciting. Dramatic scripted sections frequently appear in the modern games, usually once in every other level. The chasing 3D models have a massive sense of scale, which creates a breathtaking sense of spectacle that doesn’t exist in the classic games. is one of the most memorable moments in modern video gaming history. Although the sense of spectacle is unparreled, the sections have several problems. 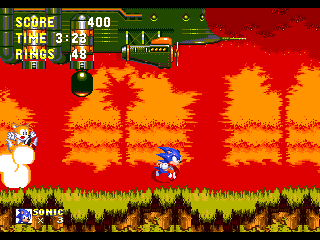 There is little for the player to do, as Sonic moves forwards automatically. As standard scripted sections occur frequently in the main levels, the lack of interaction is harder to tolerate. Recent implementations have attempted to add obstacles. An infamous example of this is the Mach speed events of Sonic the Hedgehog [Xbox 360/PS3]. Here Sonic is chasing after an item (usually the kidnapped Princess Elise). In true Sonic style, hitting an obstacle will cause the player to lose rings. If no rings are present, a life will be lost. The pace of such sections makes it difficult for the player to react to the obstacles in time. This produces frustration as the player feel that s/he has been unfairly punished, particularly as the punishment of death is overly harsh for an understandable mistake. In order to progress, the player has to repeatedly play the section until s/he learns the location of all the obstacles. This turns the game into a memory test. As the scripted scenes offer little interaction, they quickly become repetitive. 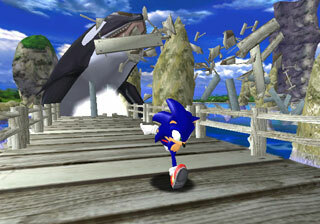 The whale in Sonic Adventure was memorable because it was unique. Similar scenes in later games are not as exciting, as they merely regurgitate what has been done before. almost seemed like a chore, mainly because it has occurred so many times before. Modern Sonic games need to reduce the use of dramatic scripted sections. This will restore the impact of these sections. When such sections occur, they must not contain obstacles that can kill the player. This will reduce the frustration allowing the player to enjoy the dramatic experience. Use the +/- buttons to rate this section.